Ryanair, Europe’s No. 1 airline, today (16 Feb) launched its biggest-ever Scottish winter schedule, with 13 new Edinburgh routes to Baden, Budapest, Carcassonne, Eindhoven, Hamburg, Katowice, Nantes, Prague, Szczecin, Toulouse, Venice, Valencia and Wroclaw (38 in total), and 2 new Glasgow routes to Krakow and Madrid (17 in total), which will deliver 20% growth and over 5m customers p.a. in total at Ryanair’s 4 Scottish Airports and supporting 3,750 jobs. 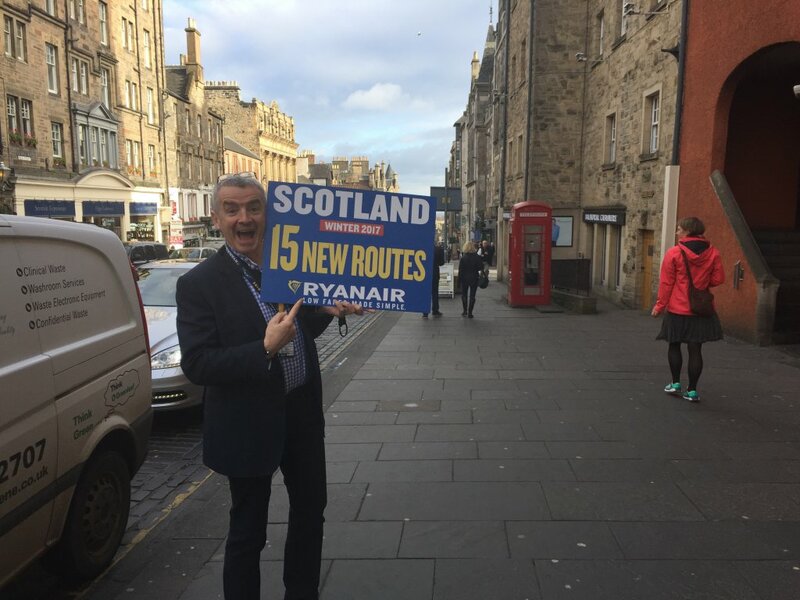 Ryanair will continue to connect Scotland with major business centres on high frequency, low fare services including Berlin (daily), Dublin (6 daily), London (7 daily) and Rome (daily), with better timings and lower fares, making Ryanair the ideal choice for Scottish business and leisure customers, as these new routes will go on sale in February 2017. 1,000 * “on-site” jobs p.a. Ryanair’s Scotland summer 2017 schedule is attracting record bookings, with more frequencies to sun destinations for summer family holidays, lower fares as Ryanair passes on lower fuel costs, and an even better customer experience, as it continues to roll out its “Always Getting Better” improvements. “We are pleased to launch our biggest-ever Scotland winter schedule, with 15 new routes and 20% growth which will deliver over 5 m customers p.a. and support 3,750jobs at Ryanair’s four Scottish Airports. We are also pleased to report record bookings on our Scottish summer 2017 schedule, and Scottish customers can look forward to even lower fares, so there’s never been a better time to book a low fare flight on Ryanair. We urge all customers who wish to book their holidays to do so now on the Ryanair.com website or mobile app, where they can avail of the lowest fare air travel to and from Scotland. We call on the Scottish Government to follow the Irish example and scrap APD entirely to allow Scottish traffic, tourism and jobs to grow and ensure Scottish airports can compete and attract more business. The scrapping of APD would enable Ryanair to base more aircraft in Scotland, add even more new routes and and create thousands of additional jobs.